Well, here's something different, reflects Madame L, who stopped reading "thriller"-type novels after the third or fourth of the Tom Clancy novels. That's when she caught on to the whole formula, which made her realize that the illusion of learning something new, which Clancy did so well back then, wasn't worth it; and the thrill of the suspense and the chase scenes were also not enough to make her go back to that type of novel. "Operation Napoleon," with an October 2011 publication date, has not changed Madame L's mind about the time-waste and mind-rot of thrillers. Madame L read the book because it came to her "free" with the stipulation that she write a review of it. That said, though, Madame L admits she enjoyed the book so much that she had a hard time putting it down. It does all that "thriller" stuff as well as it can be done. Icelandic author Arnaldur Indridason is a master of the art. And, unlike Tom Clancy, he appreciates the ability of females in the real world and thus in his fictional world to be actors on the world stage, to be brave and strong and resourceful. It's like a revelation in the world of men-authored thrillers! Another realistic twist is that the heroine doesn't fall asleep on a plane with a teddy bear she's bringing home for anyone: her happily-ever-after is a little more muted than we expect from this genre. Indridason also spares us the chauvinistic Americanism of the Clancy novels, replacing it with a more realistic view of American arrogance abroad. In fact, the Icelander gives us a feel for the resentment felt by the "locals" when U.S. Delta forces take over, American diplomats lie to the Icelandic government, and crazy CIA commandos go around shooting and torturing anyone and everyone they see as a threat to their mission. And did Madame L mention that the American mission itself is crazy and stupid? Yeah, so this book is almost an anti-thriller. If you're into thrillers, you'll love it, and if you're not, you'll appreciate its quirks. And if you'd like Madame L's copy, she'll send it on to you. I think I've said this before, and I'm sure I'll say it again: I cannot imagine any circumstance in which I would vote for Mitt Romney for president. But I still would hate to stoop so low as to make the ad-hominem attacks being made against him and all his ancestors lately by both liberals and conservatives. The latest attacks on Romney's stance on illegal immigration are based on the fact that his great-great-grandfather fled across the Arizona border into Mexico in the 19th century to avoid being prosecuted for his practice of polygamy. Here's one story on the subject. Give me a break. Puhleeze! Have you always wanted to be a model? Madame L confesses that for about 5 minutes, when she was 16 years old, she thought that would be a great career. Then Madame L had a college professor who confessed that he and his wife loved to spend Sunday mornings imitating the models in the ad pages of the New York Times. He said it was the most fun he ever had without an alcoholic beverage in his hand. Madame L wouldn't know about that, but she hopes you'll have fun with this surprising fiction, invented by artist Yolanda Dominguez. What's your favorite pose? Madame L's favorite is the girl lying down on the sidewalk --- because of the passersby who gallantly help her get up. Madame L thanks the artist and the real-people models for this video. But if they're in Canada, and a big Canadian company wants to tear them up to find oil to export to the U.S., then that's okay, right? And if the words "tar sands" mean nothing to you, and you haven't seen photos of the effects of the strip-mining used to get oil from tar sands, then that's okay, right? And if the pipeline required to bring oil from Canada's tar sands oil reserves to the U.S. cuts through the Ogallala Aquifer, the main source of freshwater for residents and farmers in Nebraska and seven other states in the Midwest, and if a pipeline built by the same company leaked (i.e., leaked oil out into the pristine environment) 14 times in its first year of operation, then that's okay, right? Because Canada actually has more oil reserves than any other country in the world besides Saudi Arabia, and we don't want to keep buying oil from the Saudis, so that's okay, right? No, of course not, none of the above. That's why I hope you'll join me in asking Pres. Obama to reject the Keystone XL proposal, which would build a 1,700-mile pipeline from Alberta, Canada, to the Gulf Coast of the U.S. It's not just you and me. Nine Nobel Peace Laureates have petitioned Pres. Obama not to give permission. The National Resource Defense Council has produced a fact sheet about the Ontario tar sands. Other Americans have allowed themselves to be arrested in protest over the proposed pipeline. The issue is controversial in Canada, too. But, anyway, you don't have to get arrested. The Tar Sands Action website will show you some things you can do. For starts, you can sign the petition. Then, look at the other articles on the website to see what others have done. Please, she's our Mother Earth, and we want to share her with our children's children, and their children's children, on and on and on, for generations to come. Madame L here again, with a tale of a dragon. Madame L has been enjoying Kate Klimo's Dragon Keeper series (Yearling Fantasy). The first story, "The Dragon in the Sock Drawer," begins when ten-year-old Jesse hears a voice talking to him from a geode or thunder egg. Of course (!) it's the dragon who is about to hatch from the rock --- because thunder eggs really are dragon eggs, as we all know. Jesse and his cousin Daisy protect the dragon when she hatches. They name her Emerald (Emmy for short), and she sleeps in Jesse's sock drawer while she's still young. Madame L has read only the first two books of the series, "The Dragon in the Sock Drawer" and "The Dragon in the Driveway." In the "Driveway" book, we're introduced to more characters with origins in folklore from many traditions, all of them charmingly and wittily portrayed. Madame L is looking forward to the next two books, "The Dragon in the Library" and "The Dragon in the Volcano," and will report on them forthwith, or as soon as she reads them, whichever comes first (Hint: "forthwith" will not come first). If any of Madame L or Aunt Louise's readers are interested, Aunt Louise would be happy to mail to them her copies of these and the other books she reviews here. They're also available from Amazon.com. I miss you so much! I remember going to my first Borders at one of the outlying strip malls near Tysons Corner in Northern Virginia. We lived so far out in the boonies that going to Tysons was a huge thing, and it had been forever since I'd been inside a bookstore. When first I saw you there, I practically swooned for joy. I bundled up my little kids and wandered through the store, mouth agape. It was like a huge library, but I could take the books home and write in them, highlight them, bend the spines back and fall asleep reading them without worrying about a scolding from the librarian at the bookmobile! I fell in love with you that day. Then, when we moved to the Pacific Northwest, I existed again for years without a Borders, unless I wanted to drive to Portland, which I didn't, and don't; so when I found that you were building a new store 4 miles from my home, I was ecstatic. And the people at this Borders have been absolutely wonderful! They have helped me find books, they have chatted with me as I wandered the aisles and then as I checked out. They have been so much like me (except for the average 25-year age difference) that I felt they were kindred spirits. But now they're gone, some able to find jobs nearby and some not so lucky. I'll miss them. Now you're gone. You've been a friend, an intellectual support, and a refuge. What do I have left? Oh, yeah, Barnes & Noble, which is okay and will obviously have to do for now ... and (cue sinister music) Powell's. Powell's, the home of the perfectly-raised-to-an-art-form-snotty-and-unhelpful salesclerk, the home of the musty smell of old books, the home of overpriced crap. To assuage my pain, I've haunted the aisles of my own Borders bookstore in the past 4 weeks picking up a few last bargains. I've spent so much money, so much more than I would in a normal 4-week period, that I hate to add it all up. But I tell myself these books will have to last me for the amount of time I would have normally picked them all up, which is probably a couple of years, and I got them for much less than I would have paid otherwise. I've been reading like crazy, and enjoying every minute of it. I'm guessing that when I get through them all I'll have found some I wouldn't have ordinarily bought, wouldn't have bought except for the grief; but, then, that's life, isn't it. I'll take some of those ones to Powell's, stoically bear up under the scornful gaze of the buy-back clerk, and use the credits to buy replacements there. But not until I have to. Ten years ago today. I hope everyone isn't sick of the tributes and memories. Here's mine. I worked in the Southern Building, 15th and H, NW, in Washington, D.C., about 3 blocks from the White House. We were having a normal morning of work when one of our political specialists, who always had a TV turned on to some news station or another, called us to come in and see what was happening: An airplane had flown right into the World Trade Center, and the tower was burning. We watched, transfixed. I don't remember if we actually saw the second plane fly into the second tower or what the sequence was. We were all in a state of shock. One of my coworkers had a niece who worked at the World Trade Center, who later described her escape from the second tower: Some building management person told them all to stay where they were, but a few minutes later they were told to evacuate. She felt she had to run. She grabbed her purse and asked the guy at the next desk if he wanted to come with her. He said, "I’ll catch up with you; I'm going to call my wife first." He was one of the ones who died. She ran down flight after flight of stairs. Once out of the building, she kept running, running down the street and across the bridge to safety. She ran until she couldn't run any more, and then she walked. She finally stopped and found a phone to call her parents to tell them she was okay. While this was happening to her in New York, her aunt, my coworker, was crying for fear for the young woman's life. And then we heard that the Pentagon had been attacked. Outside, we could hear fire truck and ambulance sirens and horns honking, and we could see people running down the street, swarming into the McPherson Square Metro station. I called home, lucky to get through, and left a message. My son was at school, and my husband was out of town. Then I started sending email messages to family members. I thought I was going to die there that day without saying good-bye to my husband and children. Our CEO gathered us together and told us all to go home, any way we could make it. I grabbed my best friend from the office, who was stunned, unable to move. We made our way to the Metro station and pushed onto a Blue train, which runs through Arlington and the Pentagon. My friend lived in Arlington and normally took that train, and I was going with her because she was still stunned, unable to move without my taking her arm and walking with her. Then I would transfer to the Orange train to get home. As we all stood in the train, crammed together like sardines, we talked in hushed tones. The train stayed at the station for a long time before moving. It started with a sudden lurch instead of its usual smooth start, but we were all jammed together so no one fell down or even stumbled. Cell phones didn’t work because so many people were trying to call. We exchanged rumors: It was another plane. No, it was a helicopter. It was a helicopter, but one that had crash-landed in an accident, not an attack. The Pentagon was on fire. No, it wasn’t. And so on. One man, whose uniformed chest I was crammed up against, said he would normally have been in the Pentagon but that day had to go to a meeting with a contractor downtown. His wife was there, though, in the Pentagon, and he couldn't reach her by phone. He was distraught but trying not to show it. An announcement came: The train would not stop at the Arlington or Pentagon stations. I told the man my friend and I would get off at the Rosslyn station to wait for an Orange train. We would take it to the bus station, take the bus to the Park-N-Ride lot in Herndon where I was parked, and then drive him to the Pentagon, if he liked. He said no thanks, he would try to find a taxi or walk. He was right: He could probably get there faster by walking than by going through those elaborate steps I needed to take to get to my car. Of course we never heard how he made it there or whether his wife was one of the survivors. My friend and I got to my car, and I drove her home. She invited me to come in for a minute, but I couldn’t. I had to get home. And that was that --- but not really. That attack changed everything. On the personal level, I couldn’t make myself go back to my old commute for a long time. Instead of taking the Metro, I took the bus all the way, a longer but safer commute. I kept a plan in mind for what I would do for this, or that, for every, circumstance. For months, I was on high alert all the time. My son-in-law, a Muslim, was looked at differently by other people. Our whole country changed. The whole world changed. I know there's more to be said and written about this, but right now I don't have the words. Maybe later. "You're not really from Social Services, are you?" Great line, delivered by Daniel Mays, one of the finest actors in Britain (so says Matt Smith, and so agrees Madame L, who brings you this review courtesy of Aunt Louise). It's in Episode 9, Season 6, the episode originally titled "House Call" but eventually called "Night Terrors." In this episode, a little boy named George is scared of the things in his closet at night. He sends a distress signal "Please save me from the monsters!" Doctor Who arrives, eventually (of course), and gets to deliver HIS great line, "Trust me. I'm The Doctor." Warning: This episode is really, really scary. On the other hand, Madame L is possibly more easily scared than many other viewers. Madame L in fact remembers watching an episode of "The Twilight Zone" once when she was babysitting some little kids who then went to bed with no problem, while Madame L was afraid to walk down the hall to check on them. Update on "The Name of the Wind"
It's brilliant! It's beautiful! It's gripping! It's breath-takingly well written! And it makes you want to rush out to buy or borrow the sequel! Madame L apologizes for using so many !!!!!'s! "You may have heard of me." By the end of the first book, we haven't even got to the parts about stealing princesses back from sleeping barrow kings, though Kvothe has found a barrow. Kvothe hasn't been expelled from the university yet, but we begin to see how that will happen. He has tread some paths by moonlight and others in broad daylight that would be beyond most other humans, and he has fallen in love with the beautiful and elusive Denna, who sings with him one of those beautiful songs. And we begin to understand why his Faeren friend and pupil Bast has lured The Chronicler to the Waystone Inn to meet Kvote and record his story. Oh, yes, Dear Reader. Read it! 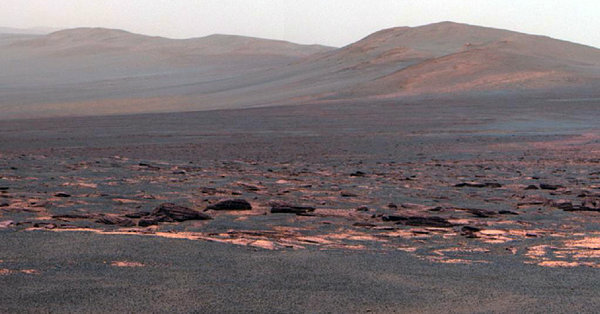 Opportunity, the little rover that could, has trundled her way into a new Martian crater called "Endeavour." And there she has found rocks not found in any of her earlier rove-abouts. The first rock she looked at in this crater appears to contain zinc and bromine, which may indicate the earlier presence of heat and water on Mars. Also, NASA vehicle, the Mars Reconnaissance Orbiter, has detected from orbit clay deposits. The two surface rovers haven't found these or similar deposits yet. Why does anyone care about clay deposits? Clay forms in the presence of water, again suggesting an earlier time when Mars' surface was warm and wet. Just think! Opportunity has been working her way around the surface of Mars since January 2004, and she's still going strong. Her companion rover, Spirit, has been out of communication with NASA scientists since May 2009, when he got stuck in some sand in a position turned away from the sun, so he couldn't charge his solar batteries. But, earlier, Spirit, as well as Opportunity, discovered additional evidence that Mars used to be warmer and to have liquid water. The next surface-rover expedition to Mars will bring the SUV-sized "Curiosity" (again, a female). 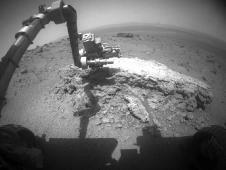 Like Spirit and Opportunity, she won't be looking specifically for life forms, but she'll be able to find molecules and traces of water and other liquids, traces left from long-ago times when Mars provided a more nurturing atmosphere for life. A farmer is driving to a Saturday market with his truck full of boxes of strawberries. He picks up a hitchhiker and they talk about what a great year it's been for strawberries, how good the strawberries look, what a nice day it is, and so on. The hitchhiker asks, "What do you put on those strawberries?" The farmer, thinking of course that the hitchhiker is asking about his farming methods, replies, "Just your standard fertilizer." The hitchhiker is shocked. He says, "Really? I eat my strawberries with cream!" On the recommendation of a friend, Madame L has started reading "The Name of the Wind," by Patrick Rothfuss. The paperback edition is over 700 pages long, and so good that Madame L doesn't mind taking her time to read it leisurely, enjoying the book's amazing structure, plot, characters, details, and overall style; and also doesn't mind writing a review even before finishing it. The author has a website, where Madame L found out that this is Book I of a series, or, as the Amazon.com website puts it, Kingkiller Chronicles, Day 1. It's available at Amazon for $8.99. The second book,"The Wise Man's Fear," or Kingkiller Chronicles, Day 2, is out in hardcover and available from Amazon for $19.77. Madame L is about halfway through the book, and still hasn't gotten to the part where Kvothe (pronounced the same as "quoth") has been kicked out of the university --- but he seems to be working at it. So, Aunt Louise and all her pals: This one's a keeper. I avoid political arguments. Like most people, I like to be agreeable and like to be around people who don't seem to have some kind of bone to pick with me. Sometimes it helps to be up front about my political and social views, so I let it be known right away: I am a socially conservative Christian with politically liberal views. I think my views are based on what Christ would do: Take care of the poor and needy, stand up to corruption and hypocrisy, and so on. I understand that other people who are just as religious and/or "spiritual" as I am may have completely different social and political views and may also think their views are based on Christian (or Jewish, Muslim Buddhist, Hindu, Wicca, or humanist) ideals or scripture. So I don't want to argue with people about any of it. I like to find common ground and stay there. Oh, I've been known to argue, even to get angry while arguing, about some point or another. But I'd prefer not to. It's just a nod to common courtesy, nothing more. Please, all who read this blog, if you are offended by my political views or are in a mood to argue, it might be better to take your argument someplace else. Feel free to post your opinions on your own blog. Write a letter to the editor of your local newspaper. Attend a demonstration at the office of your Congressional representative. The world has enough discord without getting into it here.